Though it is now a Croatian peninsula, Istria has not forgotten its Italian past. Our campsites are at the crossroads of two cultures with a rich history. To make the most of this Mediterranean jewel, we have set up our mobile homes and bungalows on its shores. This gives our campers prime access to all the stunning pearls it offers. 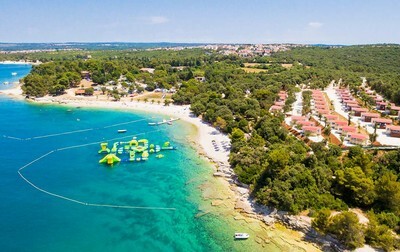 Not far from Pul is the Brijuni National Park, an archipelago of 14 islands and a nature reserve that is home to more than 77 plant species, and there is also theSaint Euphemia Cathedral in Rovinj, about twenty miles away from our campsite in Porec. And don’t forget the hilltop villages of Motovun and Groznjan, not to mention the Temple of Augustus. Istriais brimming with things to do, starting right from our campsites: kayaking on the high seas, mountain bike excursions or climbing for our most athletic campers, or kick back and relax on one of the many sandy beaches. 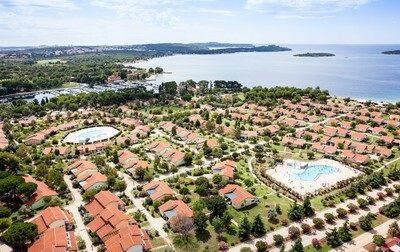 Istria is a heavenly holiday destination that will delight couples, friends and families alike. And to recover their strength after an action-packed day, hungry campers will love fritule, little doughnuts flavoured with figs, and kroštule, pastries made with fried dough. Istria is blessed with particularly warm summers, letting our campers savour the beauty of the peninsula.